Cut right through the daily task of opening mail with this clever and useful letter opener. The saw's teeth will slice into any grade of paper, and the bright red handle gives it a fun and functional edge. Bound to toughen up any desk area, this tiny tool is a perfect present for handy men and women everywhere. Made in China. The product is great and I loved the look of it! It was a gift for my husband, who is crazy about tools and he loved it. Works well to open letters... also very cute. My husband loves it! I bought this strictly because! That's right, style. It doesnt rip smoothly but it does the job. I mainly like the looks and comments I get from people that want to try it. It's a conversation starter. Then they go home to view the site. Uncommon Goods it stylish! I got this for my husband who opens just about everything with a letter opener AND he's of the mind that you can't have enough tools. So I thought, why not? He really enjoys his saw letter opener. It even cuts through the more stubborn mail we get sometimes. The kids gave this as part of their Dad's gift. They were very excited to give him something unique - - with a practical use - - that no one else has! Bought as a gift, didn't use it myself but was delighted with the look. I gave this to my Dad as a Father's Day gift. I think it was featured in an e-mail by Uncommon Goods and the subject read "For the Father Who Has Everything." That caught my eye, so I checked it out, saw that the price was within my budget, and ordered it. He just got done building and finishing the basement in his home so it was kind of like his reward! I got this letter opener to make me smile while I open letters. 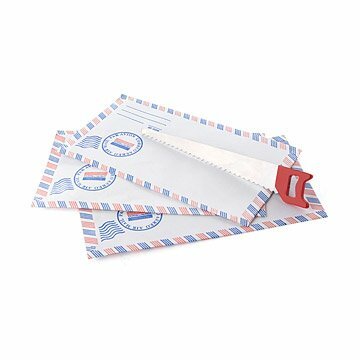 The design is super fun and unique but it doesn't actually work to well as a letter opener, I was left with shredded and jagged envelopes.